China, 1837 (Aug. 30) Canton, China to London, England, gray folded letter datelined "Canton August 30. 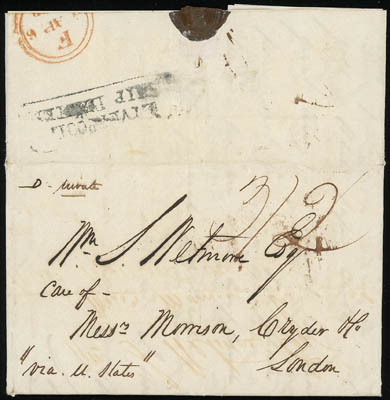 1837" from S. Wetmore to William Wetmore Esq., care of Messrs. Morrison Cryder & Co., London, endorsed "via U. States" at lower left, "Liverpool, Ship Letter" framed backstamp and manuscript "3/2" rating, red London (4.6) arrival backstamp, this is a duplicate letter with original sent per Duncan via St. Helena to London, letter content concerning sailings and trade matters, "…You know the uncertainty attending this, particularly when they belong to the Tea Men, and we may be forced to settle at high prices, even in the absence of orders at present or lose them entirely - What are we to do? No Orders!… The situation of the Hongs is enough to dampen the spirits of any one. There must be a great revolution before long - the present system cannot be carried on…We anticipate difficulty in their being able to get the teas from the tea men, unless under cash advances to full cost… The inside opium trade is stagnant the only operation to the coast & outside. The drug is terribly dull…"; horizontal fold, F.-V.F. A link back to Sale 74 - Lot 555, along with its description, will be appended to your message.